This post involves various paints and tiny brushes, and ended up all being gifts for boys. 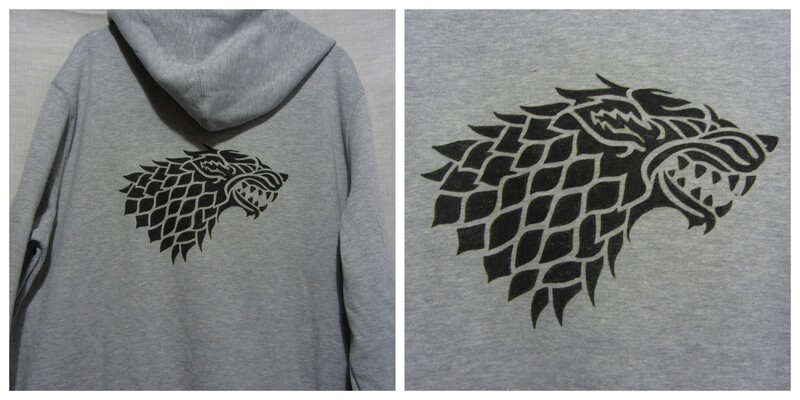 My (not-so-little) brother has been desperate for a Game of Thrones hoodie with the House Stark sigil on for ages, but they’re pretty expensive, so I decided to stencil the direwolf logo onto a RTW hoodie (I did debate sewing the hoodie as well, but in the end took the easy route). Basically, I then took the super long route and printed out a black and white line drawing found on a google images search, then converted it into a stencil, but I could’ve just used this free stencil. And then realised I couldn’t stencil it because my spray glue was at my sisters, so I drew round the stencil holes with silver metallic gel pen and then hand painted it with black Dylon fabric paint. I could’ve done a second coat in places to completely even out the amount of paint, but I think the slight variation kind of goes with the image and the edges are very defined, so I’m really happy with how it came out (and might have to make myself one to wear round the house!). 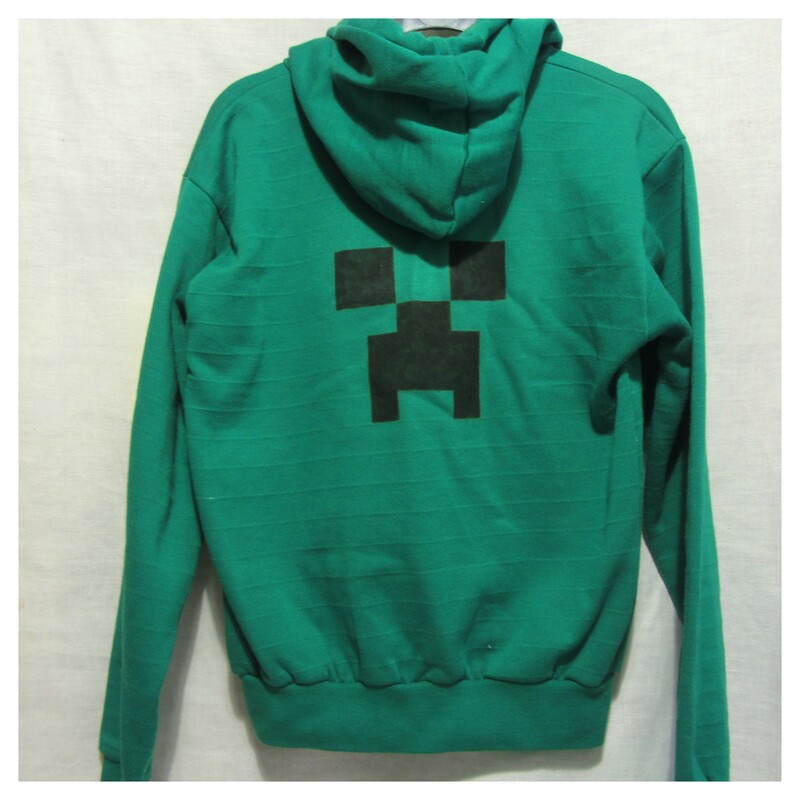 My oldest nephew is massively into Minecraft and after a fruitless search to find a RTW Minecraft hoodie (sold out in every store I went to due to my last minute shopping) and a frantic search for a plain green hoodie (who knew they were so rare), this came about. I drew the design onto the back using a ruler and gel pen, then hand painted it with the same black Dylon fabric paint, as it seemed quicker than faffing with cutting out a template or even using masking tape along the edges of the squares. It’s a bit giant on him (there was only one size of hoodie left) but at least it’ll fit him for more than a couple of months. Design, copy or trace your logo onto thick paper or card. Cut out around the outside to create a template. Use a metallic gel pen to stencil the outline onto your shoe. Use white acrylic to paint inside this line to create a base (I did 3 or 4 layers, waiting for each to dry before the next). Cut out the subsequent layer of your design (eg: for Batman, I cut out the bat logo, for Spiderman I cut out an eye, and for Superman I cut out the S). Transfer this outline to the white base layer using a pencil. Paint the rest of your design from lightest to darkest colour. For the Minecraft pumps, work out how big your grid squares can be to fit in the Creeper face (mine were 1cm x 1cm) and use a metallic gel pen and ruler to draw the grid onto the shoe. Mark which squares are black, then fill in the other squares with various shades of green before painting the black squares. I did end up outlining the Superman logo in black (which was super annoying to do) and I really wish I hadn’t used such dark green right next to the Creeper face. But the kids liked them!